Heat the duck fat in a skillet, and sauté the onion on medium heat until soft. Add the shredded duck and heat through. Season with salt and pepper to taste. Roast the tomatillos (or tomatoes), onion, garlic and chili peppers on a dry griddle or non-stick skillet on medium heat until charred on the outside, about 5 minutes, turning with tongs to ensure even roasting. They should be soft but not burned. Place the roasted ingredients in a blender with just enough water to move the blades. Blend to a coarse puree. Add the avocados, cilantro and lime juice to taste, and puree just enough to combine ingredients. The salsa should be chunky. Add salt and pepper to taste. In a bowl, mix the green cabbage, red pepper, a little soy sauce, the lime juice, a little vinegar and honey. Mix. Add salt and pepper, and add a little more of each to correct seasoning if need be. Heat the tortillas on a griddle. If mini tacos are not available, use one mini soft tortilla for each taco. 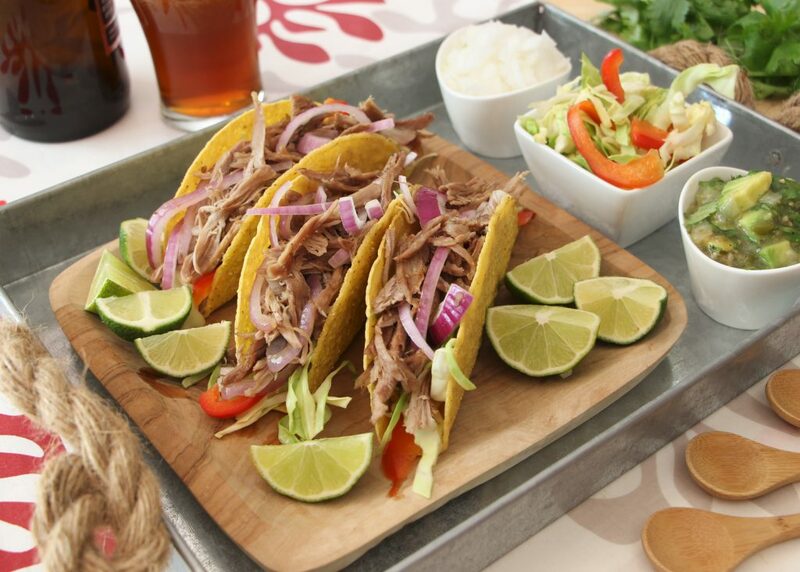 Place the duck meat confit in or on each taco shell, top with salsa, red pepper cabbage mix and mini cilantro (if using the soft tacos, fold over). Top with extra chopped onion and mini cilantro, along with extra salsa.